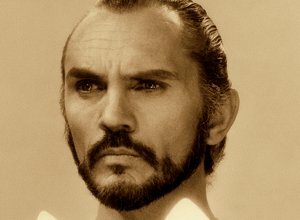 We all love General Zod from Superman II. Ruthless, arrogant, elegant, and awesomely powerful. But he wasn't always a general. At some point, Zod had to be a fresh recruit, just starting out in the Kryptonian military. So once again, we present the continuing story from "I, Zod: The Journal of Private Zod." For parts 1-3, click here. For parts 4-6, click here. I have met another soldier whose stupidity is equaled only by his brute strength. He is named Non. I first met him during a weapons drill. We were all issued laser rifles and had to practice loading energy crystals and unloading them. I was, of course, carrying out this task with exceptional speed and dexterity. Yet I heard cries of alarm behind me. I looked over to see an enormous soldier peering directly into the front of his rifle's barrel. He tried to push the energy cartridge into the front, then the handle. Other soldiers fled from him, but not before his rifle went off and killed the soldier next to him. One wonders how such an ignorant brute could have made it into the Kryptonian army. It says much about the standards of the modern Kryptonian army. Last night, I was the victim of a childish prank where my sleeping hand was placed in a bowl of warm water. I awoke to find my bedclothes soaked in urine and my fellow soldiers laughing around me. The ringleader seemed to be Mok-Ar. Their laughter soon turned to screams as I drew my cutting crystal and attempted to slash Mok-Ar in the throat with it. Unfortunately, my sodden pants entangled around my legs and I ended up falling onto the floor. This only served to delight them further. I warned them they would pay for their defiance and fled. The supplier said that I will not be allowed a new pair of pants, so I was forced to dry out my urine-soaked pair and put them on again. This is hardly fitting of a man of my stature. Mok-Ar shall pay for his treachery. Last night, I saw a program featuring a scientist who claimed to have invented a new substance made from rocks melted down and reformed. He called the resulting concoction "metal." He claimed that metal could be shaped into geometric shapes or small objects. He even suggested that these smaller objects could be combined to build larger objects that he called "machines." The scientist's theories were held up for derision, as they should be. I fail to see why Kryptonians should reduce ourselves to such barbaric methods when our technology of forming needed tools through the growth of crystals is so highly refined. Still, the theory does have merit. I imagine creating a knife or sword from this "metal" that would go undetected by the weapon scanners at skyports and government offices. Yes, indeed, a man could do much damage with this "metal." Perhaps, it would be wise to investigate this further. Today, we began weapons training. Each soldier was issued a crystal capable of generating a beam of lethal force. Our sergeant went into great detail on how to clean the crystal, load its power battery, and how to fire. He then advised that we would begin target practice. I took the opportunity to aim and fire at the private next to me, who immediately incinerated into a cloud of ash. For some reason, this caused great confusion and panic. Sergeant confiscated my weapon and ordered me locked in the stockade. I failed to comprehend his reaction. After my release two days later, it was explained to me that the sergeant intended for us to practice our weapons on non-living targets placed on the field across from us. I blame the sergeant for his lack of clarity. Before I was drafted into the military, I had a female companion named Jud-Ee. She professed her love for me, but I found her intellectual inferiority tiresome. However, I complimented her on her good taste in selecting me as a mate. I informed her that she would one day be my queen, and I would rule the Galaxy with her at my side. Once, she asked if that meant we would rule together. I corrected her. I will rule the Galaxy, and she will stay at home to breed my progeny. She seemed taken aback by my statement, which I find confusing. Surely she could not believe that a mental giant such as myself would require another to aid him in his rulership, nor would I tolerate another interfering with my commands. Besides, she is a female, inferior to even the below-average male, let alone a giant of masculinity such as myself. This explanation seemed to upset her even more. Even with my vast intellect, the folly of women escapes me. Since beginning my military career, I have been corresponding with Jud-Ee on a daily basis, but have yet to receive a reply. This confuses me. Surely she could not endure my absence for long. I'm sure my letters have simply failed to arrive. Once I rule Krypton, repairing the dysfunctional postal android system shall have my priority. This post is part of the month long "A-Z Challenge." For 27 days, we'll be choosing a letter from the alphabet and crafting a post around it. To read more of the posts in the series, click here. To find out more about the challenge go here. Thanks for the great sci-fi entertainment during the A-Z challenge. Its been awesome! I'd forgotten about that Zod character. He certainly was arrogant as you say. [/url] had ever become the most valued part in the women隆炉s life . Mulberry hobo Handbags Sale Mulberry satchel Handbags Sale Mulberry messenger Handbags Sale . Open a woman隆炉s clothes storage space and you are definite to find one or more mulberry sale pouches in it . But whose look do you prefer?